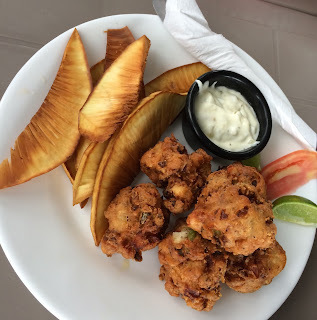 While in the Honduras, I had the opportunity to sample some conch fritters. Unfortunately, deep frying in batter doesn't seem to be the best way to treat the mollusk, as the conch itself got rubbery, and the sweet flavor was overwhelmed by the heavy batter. However, the accompanying breadfruit fries were quite delicious. I'm puzzled by the poor availability of breadfruit in the Texas area. A staple in much of the world, the breadfruit is like a tree borne potato. When unripe, it is starchy, and can be cooked in all the various ways a starchy ingredient is used. On ripening, the fruit becomes sweeter and softer, and can be treated as much most fruits. The seeds are small and edible, the trees are propagated from cuttings, and can produce bountiful fruit for decades. The only issue is the tree grows only in tropical climates, but Texas should be close enough that a variety can probably be evolved to survive here. 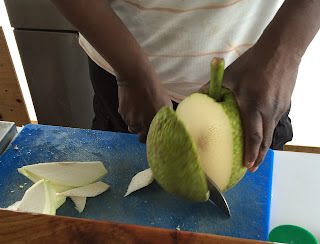 In a sense, the breadfruit reminds me of plantains - and we have a ready supply of that in the big cities. But, strangely enough, breadfruit remains remarkably rare.